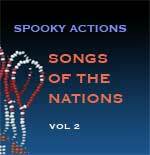 Spooky Actions continues to explore the repertoire of First Nations music with exquisite settings of dances, prayers and songs hailing from the Chipewa, Omaha, Navajo and Musgean nations. These timeless melodies find new life within contemporary interpretations by John Gunther on winds, Kirk Driscoll on percussion, and Bruce Arnold on acoustic and processed electric guitar. Thomas Buckner and Michal Shapiro contribute the vocals.